Choosing a Toyota provides you with the chance to drive away in a vehicle of the highest quality and which embraces innovation. After all, this is a manufacturer that has been a pioneer in hybrid technology for over two decades. It’s important, therefore, to ensure that it’s maintained in the best condition possible, not least for when the annual MOT test comes around. With Motorline Toyota, you can benefit from both complete aftersales care as well as our competitive MOT offer, keeping your model in prime condition for longer. Booking your Toyota MOT is both affordable and effortless. With our manufacturer-trained technicians and access to the very best Toyota parts and accessories, we’re able to ensure your vehicle passes its MOT test without difficulty, even providing a free re-test should it fail first time. Not only that, we’ll also conduct a free 37-point visual safety check and provide an environment in which to wait, unwind, and relax while your model it put through its paces. For just £54.85, our MOT testing services represent exceptional value for money. Book your next MOT with Motorline Toyota today and look forward to the very best care for your vehicle. We look forward to helping you stay safe on the road. While you’re relaxing with a free tea or coffee, flicking through the free newspapers or catching up with your emails on our free WiFi, we’ll be busy looking after your car. And unlike most garages, we mean beyond its MOT. 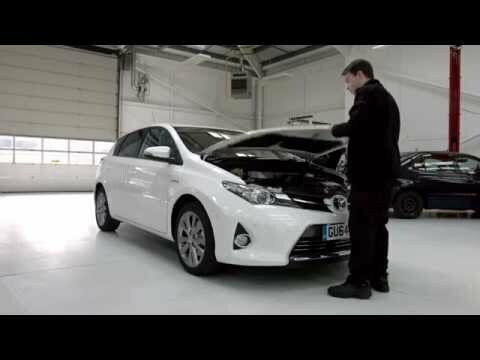 Our Toyota Trained Technicians will carry out a detailed 37-point Visual Safety Check of your car to make sure there’s nothing they can spot that could cause concern. And if there is, they’ll inform you straight away.